Unique design just for you. No ideas!! Then let our design studio create a unique logo or slogan for you. We use the latest software so you can see your design and adjust it accordingly. Weeks Work offer a full design to installation package so you don’t have to worry about measuring up or choosing type-faces, we do all that for you; and we pride ourselves on our fast turn-around. 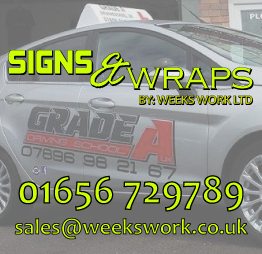 If your vehicle is dropped of to us at Weeks Work Ltd (Brynmenyn Ind. Est.) in the morning – it can be picked up at lunchtime! If you already have a logo or slogan then we will convert your logo into a printable format, for use on any of our products. Our design team will liaise with you to arrive at the perfect solution to you requirements.